Robin Hood’s Bay has a rich history. Yes, it used to be a fishing village but even more interesting is that is was formerly the centre of smuggling operations. Today, it is a lovely holiday village below the North York Moors National Park where visitors can enjoy the interesting coastline, walk breathing in the fresh sea air as well as exploring the National Park. The narrow streets are evidence to its age and they existed in the late 18th Century when there was much more activity than there is today. Smugglers knew their way around, using hidden alleys and secret tunnels to ferry their contraband. Many of the villagers were involved but today’s inhabitants are purely law-abiding. Children will love the beach and they may actually find some fossils while the Museum will tell you more about this lovely village. 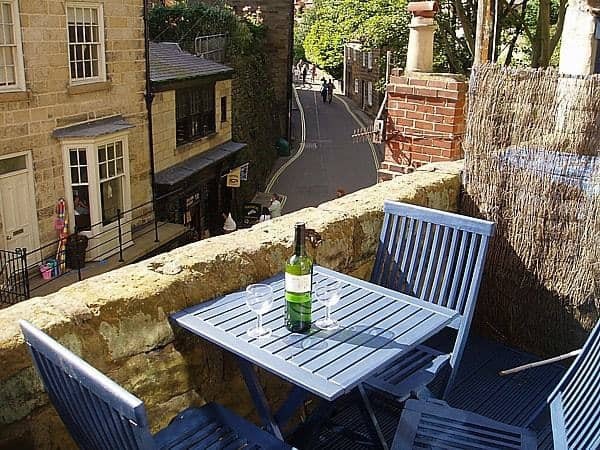 If you are starting to think that this little village is a great place for a quiet holiday, here are some Robin Hood’s Bay Cottages to consider. There are properties that are suitable for couples, families and groups of friends, even places that can comfortably take up to 10 people. With such flexibility, Robin Hood’s Bay may be just the place for you. Robin Hood’s Bay Holiday Cottages offer the most comprehensive selection of luxury holiday cottages in Robin Hood’s Bay. Whether you’re looking for celebration cottage for a family get together or a cosy couples Fishermans cottage for a weekend – you’ll find your perfect place with Robin Hoods Bay Holiday Cottages. Ingleby House has three self-catering apartments, two of which have good sea views. They are just a short distance from the beach and are suitable for two. This 300-year-old cottage is delightful accommodation with three bedrooms, a double and two twins and is located just a short distance from the sea. There is a modern well-equipped kitchen though the property maintains much of its traditional feel. This large 3 bedroomed cottage has 2 double bedrooms and a third with 3 single beds. It is no smoking or pets but there is a lovely secluded terrace, full central heating and comfortable living accommodation with TV. This terrace property sleeps up to 6 people, two bedrooms and a double in the alcove next to the lounge. The bathroom has bath and shower and the lounge with TV is also first floor. There is a large ground floor kitchen/diner. It is no smoking and no pets. This lovely 3 bedroomed property has a large garden with an outside patio dining area. Internally there is a kitchen/diner, bathroom and lounge with open fire. It comfortably sleeps 6. Pets are not allowed and it is no smoking. This two bedroomed former fisherman’s cottage has two bedrooms., sleeping 4, and retains its traditional feel with wooden beams and an open fire. There is a private south-facing patio for guests to enjoy. No smoking or pets. This 17th Century cottage has been fully modernized to offer ideal holiday accommodation in three bedrooms, a double and 2 twins. There is Wi-Fi for guests, parking permit and pets are allowed. Fully centrally-heated, there is bath and shower as well as 2 WCs. Brincliffe has a master en-suite and family room allowing it to cater for 5. It is fully centrally-heated and has spacious living accommodation including a large kitchen/diner and lounge with TV Free Sat and DVD. It is no smoking and no pets. This former fisherman’s cottage has been newly refurbished. The accommodation is fully centrally-heated and has two nice bedrooms, as well as an outside seating area. There is free parking and pets are permitted. Burton House close to the seawall and sleeps up to 5 guests in a large attic bedroom and a first-floor bedroom with single and bunk. It is fully-centrally heated, with bath and shower and amble living space. There is a parking permit but pets are not allowed. Coach House is a centrally-located cottage with two good bedrooms. The kitchen is large and heating comes from a log burning stove. The lounge has an open fire, TV, DVD as well as books, games and maps. It is no smoking and no pets. Dock Cottage overlooks the beach and sea. It has a double and a twin and is fully modernized without losing its 17th Century charm. There is free view TV and Wi-Fi and the property is centrally heated with a fuel stove in the lounge. Pets by arrangement and free parking. Endways has a well-established reputation from previous clientele and offers amble room for 6 guests in 3 bedrooms. There is a lounge and plenty of space for 6 around the dining table. There are two bathrooms in this fully centrally heated property and a parking permit. Ewden is a 4 bedroomed cottage with its own small garden. It is just a minute from the sea and is fully-equipped for self-catering with a capacity for 7. The patio is a great place to relax. Wi-Fi and free parking are included. Boasting two bedrooms with the ability to hold a fifth guest, Heather benefits from a private terrace, full gas central heating, Wi-Fi and Freesat TV and DVD. It is no smoking and pets are not allowed. Free parking however is included. As the name suggests, this cottage’s location is unrivalled with panoramic views over the village and the sea. There is a lovely garden with furniture and summer house. It can sleep up to 6 and has family kitchen, bath and shower and also a second WC. Wi-Fi is provided. Holly Cottage can sleep up to 8 in 3 doubles and a bunk bedroom over 4 floors. The kitchen/diner is fully equipped while the lounge has TV/DVD, gas fire with a small study area beside. Two bedrooms are en-suite and there is a top floor bathroom for the bunk room. Located close to the harbour, this open plan cottage accommodates six people with the king-size master bedroom en-suite, a twin room with doubles and a bunk be room. There is a well-equipped kitchen free Wi-Fi, permit parking and pets are permitted. This four bedroomed property, 3 doubles and a bunk room can cater for up to 8 people. One of the doubles is en-suite and there is a separate bathroom. The large kitchen and living room complete accommodation that is nice decorated. It is no smoking or pets. This cosy property is precisely that, little and only suitable for a couple. It is just 100 yards from the beach and Wi-Fi is provided. Millbrook is a two-bedroomed property, sleeping four people, suitable for couples or a small family. It dates back to the 17th Century but is thoroughly modernized. There is a private terrace externally, parking and Wi-Fi. No pets or smoking. Roma is a cottage in the lower part of the village, sleeping four in an en-suite double and bunk bedroom. There is a bath in the bathroom but no shower. The living area is open plan and is heated by a duel fuel burner. Free Wi-Fi and parking come with the booking. A mariner’s cottage on three levels, this 18th Century cottage can sleep 6 people in three bedrooms. Diner/kitchen and lounge are on the ground floor of three and there is a seating area outside. No smoking or pets. Smuggler’s is a basement apartment just 50 yards from the beach and even closer to the pub. Suitable for a couple, there is a kitchen, small shower room and welcome pack provided. Pets are welcome. Grade II The Cranny is a lovely renovated property predating 1700 and sleeping six. It is well-furnished with Sky TV and Wi-Fi. There is a lounge, kitchen/diner, bathroom with bath and shower and 3 doubles. It is no smoking but pets are allowed. The Haven over 3 floors sleeps 4 in comfort. Early 18th Century, the property consists of spacious living accommodation with TV, DVD, central heating and multifuel stove. There is an external seating area and pets are permitted. Two bedrooms sleeping 5, this period cottage is a short walk from the beach. There is a modern kitchen, dining area with dishwasher. The lounge has TV, CD, and DVD and there is central heating throughout. Free parking and pets allowed but no smoking. This cottage on the cliffs has great views. There is external decking and patio and room enough for 4 adults or 3 with 2 children. An extra twin room can be booked on the upper floor id required. There is a modern kitchen and open plan living area. This home with two doubles and two singles has gas central heating, TV and DVD and is beautifully maintained. There is a private garden and patio with free parking included. Pets are allowed by arrangement. Formerly a sea captain’s home, York House is on the seawall and comprises 2 doubles and a twin, 2 en-suite. On three floors, there is also a modern kitchen and patio facing the sea. TV and DVD are available, pets are permitted and parking free. These well-equipped apartments are all well furnished accommodation with modern kitchens, bathroom and sleeping ‘’quarters.’’ Studio Apartment on the top floor sleep, Tudor on the first floor and the Pine Room all offer accommodation for a couple with TV, DVD and CD. This 18th Century fisherman’s cottage has two bedrooms, sleeping 4, a double and twin. There is a private patio, lounge with open fire, TV, DVD and CD and central heating throughout. The bathroom has bath and shower, Wi-Fi and well-equipped kitchen. Parking but no smoking or pets. Lenwood is holiday accommodation over three floors and sleeping 4 in two bedrooms. The living accommodation retains many of the original features with modern kitchen. The first floor is bedroom and bathroom with a further bedroom above. This 3-bedroom cottage welcomes pets and sleeps up to 6 people. The ground floor is open plan with modern kitchen, TV, DVD and Wi-Fi. The first-floor bedroom is en-suite and the other two on the floor above share a bathroom. Originally a 17th Century farmhouse, this property sleeps 6 and has a lovely garden with views down to the sea. All three bedrooms are en-suite, one on the ground floor where there is plentiful living accommodation and two on the first floor. This was formerly the Village Hall, converted to have enough room for up to 10 people. It is close to the beach and it is even possible to book a self-contained one bedroomed property next door. This spacious 3-story semidetached cottage is located on cliff top with great sea views. The It sleeps 8 and is therefore suitable for large families. It has gas central heating, Wi-Fi, TV and DVD and well-equipped kitchen. The outer area includes decking and a garden. This Grade II cottage has been well refurbished to provide ideal holiday accommodation for two. The living area is open plan and there is also a nice roof terrace. This is modern living in a traditional environment. As the name suggests, this 2-person accommodation was once the local ‘’smithy’’. It is centrally heated with fitted kitchen, wood burning stove with washer/dryer. Wi-Fi is provided and pets are welcome. This 3-bedroom (2 doubles and a twin) cottage close to the beach has modern-day comforts yet retains wooden beams and traditional fireplaces. There is a nice garden with outdoor seating. Lynnfield can cater for up to 10 people. It is at the top of the village and has a king-sized master, three doubles, and a twin, all en-suite. There is kitchen, dining room and two lounges on different floors. Wi-Fi and parking are available, pets permitted and there are patios to front and rear. Close to the Robin Hood’s Bay Museum, the house sleeps 6 in a king, double and twin. There are two bathrooms, kitchen/diner and lounge and great views from all rooms. Wi-Fri is free and the private garden is a great place to relax. Robin Hood’s Bay Museum is on the doorstep of this property sleeping six people in three bedrooms, the twin being en-suite. There is a family bathroom and open plan living area and separate kitchen. Wi-Fi is provided. This cottage in Bloomswell sleeps 5, en-suite master and bunk bed with single. There are a family bathroom, separate kitchen and lounge as well as a dining room with sofa. Wi-Fi is provided and a pet allowed by negotiation. Rothwell sleeps 5 in a king and double with an extra single bed. There is a family bathroom, open plan living and dining area with a well-equipped kitchen. Wi-Fi and parking are available while there is a shared patio. A pet is permitted. Osbourne Cottage sleeps 4 in a double and twin. The living area is open plan with log burner and there is a family bathroom and utility room. The kitchen is well-equipped. Wi-Fi and parking are available but sorry, no pets. Brigholme is a two bedroomed property, both doubles and a family bathroom. The living is open plan with fold down dining table and chairs. There is a parking permit but pets are not allowed. This two bedroomed property in Bloomswell comprises a king and twin, a family bathroom and open plan living space. A duel fuel burner provides any heating needed. There is outside seating, Wi-Fi and great sea views throughout. A pet is allowed by prior arrangement. This open plan property for two has a small bathroom, hallway and kitchen. There is dining table with chairs, as well as a small yard/patio with bistro set. A pet is allowed by negotiation. Bert’s has retained its traditions while now offering modern-day comforts. There is a double en-suite on the first floor and a twin on the second. The lounge has wood-burning stove, TV and DVD while the kitchen is well-equipped. The bathroom is ground floor. No smoking or pets. This lovely conversion has a modern kitchen, spacious living and a large family bathroom on the ground floor. The sleeping is one the first floor with double and twin. The cottage has its own garden. This extremely spacious house has three bedrooms as well as plenty of living accommodation; lounge, study, utility room and kitchen. The family bathroom is also downstairs with the bedrooms on the first floor. The property has its own garden and is centrally heated. No pets or smoking. This two bedroomed, semi-detached property can sleep up to 5. The main bedroom is en-suite and there are two other bathrooms. There is gas central heating, an open plan kitchen/diner and lounge. It is no smoking or pets. This old fisherman’s cottage has three bedrooms, one on the ground floor, two sitting rooms with the kitchen on the first floor and central heating. There are three bedrooms, two doubles and a single. No pets or smoking. This terraced cottage was once a fisherman’s home with a double and twin bedroom. There is open plan kitchen/dining, lounge with TV and DVD and central heating. It is no smoking but well-behaved pets are welcome. This terrace is over three floors, two bedrooms and a small patio/conservatory outside. The kitchen is modern and there is dining and sitting areas with TV and DVD. The bathroom has bath and shower. It is no smoking and pets are not allowed. The mid-terrace has one of its 3 bedrooms on the ground floor, en suite as well. There is also kitchen and living space on that level. The other two and the family bathroom are on the first floor. There is a small garden/patio to enjoy. Sorry, no smoking or pets. This semi-detached Victorian villa has four bedrooms and so can comfortably accommodate 8. Rental is for the first and second floors; There are bathrooms on each with the living space and kitchen on the first floor. There is external garden/patio area. There are 3 bedrooms including a ground floor single, bathrooms on both floors and a well-equipped kitchen in this detached cottage that is suitable for 5. There is an outdoor seating/garden area and lovely sea views. Loving Robin Hood’s Bay Cottages? Pin it!